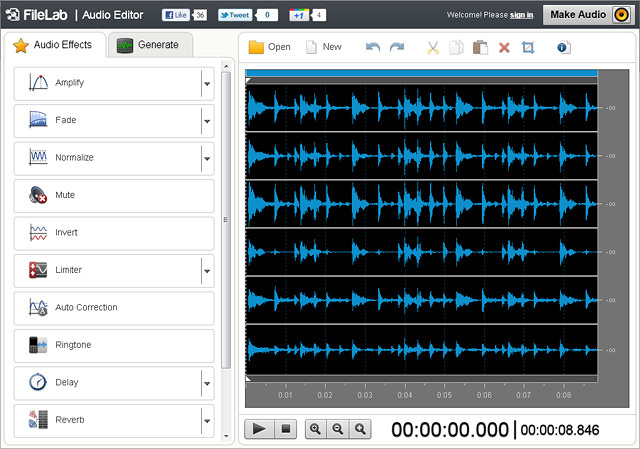 FileLab Audio Editor is a free audio application that easily edits audio tracks in browser. Split, cut, trim, mix audio files, apply various effects and filters. Create a unique ringtone for your cell phone. Save audio files in WMA, FLAC and WAV formats. The interface is very intuitive and user-friendly. FileLab Audio Editor makes audio editing process easy and enjoyable. ...... Surf through the interface, choose effects on the list and work in the audio processing area on the right. Qweas is providing links to FileLab Audio Editor 1.1.0.0 as a courtesy, and makes no representations regarding FileLab Audio Editor or any other applications or any information related thereto. Any questions, complaints or claims regarding this application FileLab Audio Editor 1.1.0.0 must be directed to the appropriate software vendor. You may click the publisher link of FileLab Audio Editor on the top of this page to get more details about the vendor.